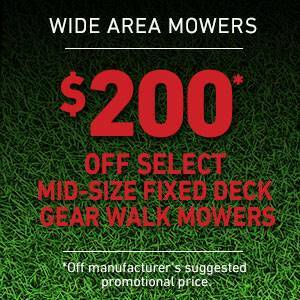 *$200 USD off suggested promo price on select Mid-Size Fixed Deck Gear Drive Mowers. Models 30632, 39634, 39638, 30672, 39674 and 39678. Valid on purchases made from March 29, 2019 through May 29, 2019. See participating retailers for details. To find a local retailer.